The U Ultra is HTC's first flagship phone for 2017, and it didn't get great reviews. It's expensive, has poor battery life, lacks waterproofing and a headphone jack, and the US model only supports GSM networks. If you really wanted one for some reason, the U Ultra is now $150 off at HTC's website, along with several other phones. In addition to the U Ultra's discount, you can also get last year's HTC 10 for $499 ($200 off). The HTC Bolt is also down to $450 ($150 off), and the One A9 is $199 ($300 off). 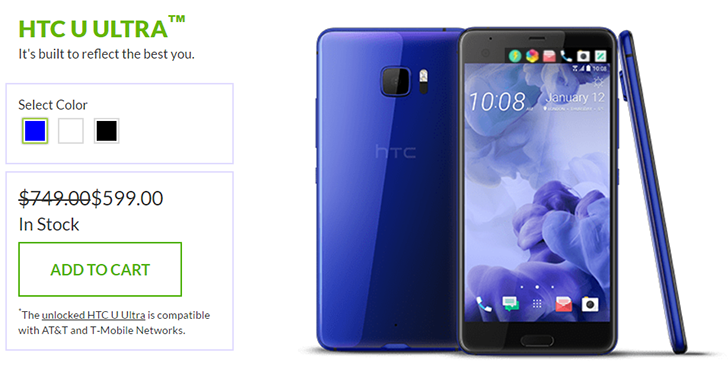 Those might not seem like great discounts, given the age of those devices, but free Uh-Oh protection is included with all purchases from HTC's site. Besides phones, HTC is also selling JBL Headphones for just $99 ($100 off). You can find links for all the discounted products at the source link below.